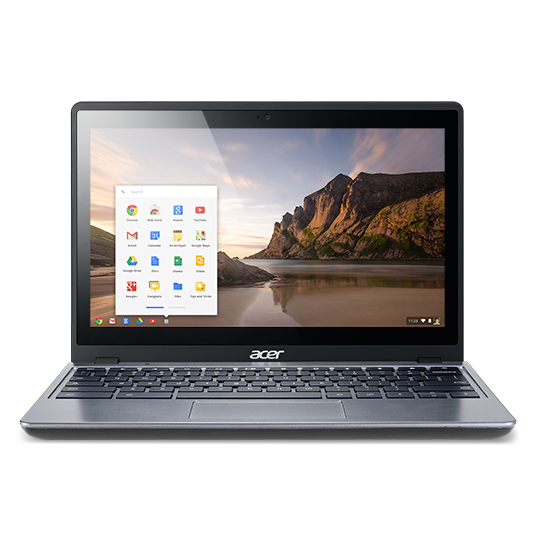 Acer Chromebook C720, Intel Celeron 2955... has been added to your Shopping Cart. You now have items in your Shopping Cart. The C720 is the most powerful 11" Chromebook you can get, thanks to the latest Intel® processor based on the Haswell micro-architecture. You can zip through your tasks and have fun too, without recharging, because the C720 has up to 8.5 hours1 of battery life. The Acer Chromebook C720, Intel Celeron 2955U 1.4 GHz Processor, 2GB RAM, 16GB SSD, 11.6 Inch LED Display, OS Google Chrome, Gray - Refurbished Laptops & Notebooks is manufactured by Acer. Buy the Acer Chromebook C720, Intel Celeron 2955U 1.4 GHz Processor, 2GB RAM, 16GB SSD, 11.6 Inch LED Display, OS Google Chrome, Gray - Refurbished at the best price in the United Arab Emirates. The purchased Acer Chromebook C720, Intel Celeron 2955U 1.4 GHz Processor, 2GB RAM, 16GB SSD, 11.6 Inch LED Display, OS Google Chrome, Gray - Refurbished can be delivered to United Arab Emirates. Buy Acer Chromebook C720, Intel Celeron 2955U 1.4 GHz Processor, 2GB RAM, 16GB SSD, 11.6 Inch LED Display, OS Google Chrome, Gray - Refurbished in United Arab Emirates of AED 399 and save 60%. The best deals of Laptops & Notebooks in United Arab Emirates. Large choice of Acer Laptops & Notebooks available in stock.